The most religious and ritualistic festival of the Bishnupriya Manipuris is the Kartika festival which continues during the month of Kartik from the Laxmi Purnima to the Rasa-Purnima. Throughout this period Arati’s (offerings of lights) to Radha-Krishna are performed in the morning, in the for-noon and in the evening in the temples by following traditional rites and rules. 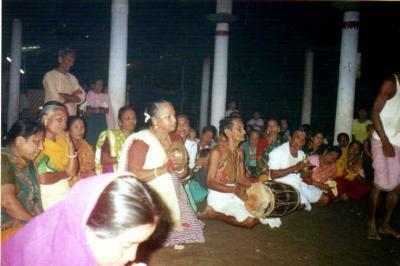 Bhajan songs are sung to the accompaniment of Kartal, Pung (Dhak), Bell, Selbong and Moibung. That time they offer Kaboks (puffed rice mixed with sugar) and fruits to the lord. Religious text , specially the Mahabharata and Ramayana, are recited and explained at every mandav’s or at any certain places where the people gather. The citation &amp; explanation of religious scriptures is called ‘Leirik-Thikorani’. Generally two knowledgeable and learned persons do this – one plays the role of ‘Thipa’ (the narrator) and the other one as the ‘Warilipa’ (interpreter). The ‘Leirik-Thikorani’ culture played a very important and significant role in propagating the Vaushnavite literature among the people and at the same time it helped in developing the folk and ancient literature of Bishnupriya Manipuri language. After the ‘Arati’ or ‘Leirik-Thikorani’, prasadam (the food offering given to the Lord) is distributed among the people. They are fed on banana or lotus leave. 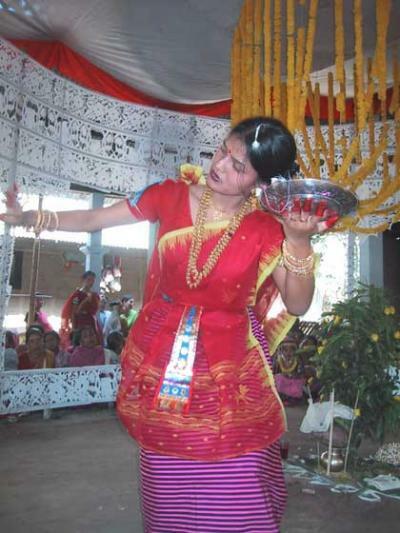 Moreover, in the period of Kartika, competition of dance with traditional ‘Dhol’s or wardrums. ‘Jhal’s or big cymbals etc are held almost everyday from villages to villages. These cultural competitions are called ‘Kartikar Phanna’ or the rivalry of Karitika. The big drums ‘Dhol’s and the big cymbals ‘Jhal’s are frequently used by the Bishnupriya Manipuris almost in every socio-religious occasions. It has been heard from some old-aged persons of the community that formerly the competition of ‘Kartikar Phanna’ used to held under the patronage of the kings. 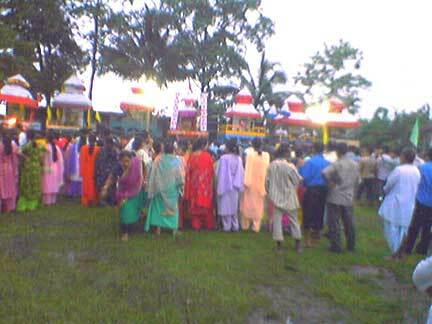 The Kartika festival ends at the day of Rasa Purnima, the great Rasa celebrated on the full moon day Kartika (December). The Kang festival of Bishnupriya Manipuris is a festival of nine-day duration in the bright fortnight in the month of Ashar (June-July) with elaborate paraphernalia. It is observed with great festivity and celebration. On the first day and the last day of Kang festival, Chariot-Procession with the idol of Lord Jagannatha is led out.In Manipur the Kang festival was introduced by Maharaj Gambhir Singh on 1832 AD. He founded the images of Jagavandhu, Balarama and Subhadra and commenced worship on the model of Puri. It should be mentioned that in the village Leishangs image of Lord Jagavandhu is worshippedwith proper rites. The images are bathed on the day of Snana-Yatra, before fifteen days of Kang. The images are carried out on the Kang ( A wooden chariot specially made for Lord Jagannath) to the accompaniment of music, offerings of fruits by individual house-holders. Sometimes persons stand behind the image and fan it with the Chamora. 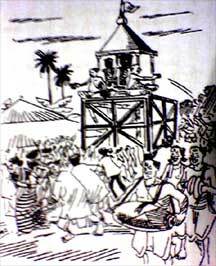 The structure of the Kang is squire, it has four huge wheels, its head takes the shape of Burmese pagoda and there are two or more long ropes so that the divotees can pull the chariot. It is said that Lord Jagannath doesn’t mind if the divotees make fun of his physical appearance. Reciting the physical appearance is not regarded as an offence where its sole aim is the complete devotion toward the lord, rather it improved the literary value of the devotional songs. It should be mentioned that the soul of Bishnupriya Manipuri Vaishnavite culture is ‘Bhagabat Lilagiti’s or ‘Radha-Krshna Lilagiti’s. From Birth to death it is our mandatory tradition to observe the rituals through ‘Bhagabat Lilagiti’s along with ‘Nrityabadhya’s. To Manipuris, praising the lord with his quality by singing is more devotional than merely chanting his name. Every evening during the periods of nine-days of Kang festival, devotional songs are sung, particularly those from the great Vaishnavite literature Gitagovinda of Jayadeva, who is considered to be the most eminent ‘Vaisnnav Padakarta’ of Bengal. The songs are sung along with clapping and dancing, by the people in the Mandav’s or shed for religious and cultural performances. After the singing of devotional songs, feasts of ‘Khichuri’s (a kind of dish made of rice and split pulses) offered everyday by the people in turns, are distributed among the folks. 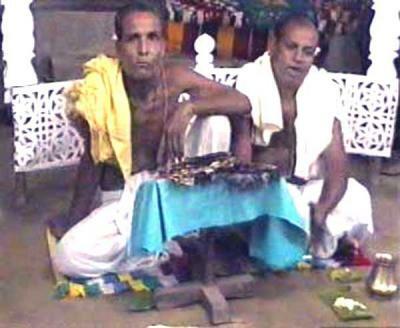 Beni-Ras is the only form of Ras, performed in Day-time in all seasons. It is also known as Diva-Ras. The highly glamorous Rasleela of SriKrishna with his divine lover of Brindaban may be divided according to the Manipuri tradition into four categories being Maha-Ras, Kunja-Ras, Basanta-Ras and Nitya-Ras. Diva-Ras is categorically under Nitya-Ras, the name ‘Diva’ naturally indicate that it is presented in the Day time. There is, as yet, no agreement among scholars as when Diva-Ras originated. This costumes and ornaments of this Ras form is quite different from the other forms of Ras. The traditional costume Pollei, is replaced by Sharee’s or combination of Chaksabi-Inafi. The Manipuri Gurus recast its dress and frameworks to meet the need of time factor. The traditional framework followed in this Ras consists of aspect of time, music and choreography. They have the option of alteration and changing in their hands, but the modification should not be out of the basic concept of Manipuri Ras style and theme.